Ham House, Richmond, England. Originally built 1610 and remodeled throughout the 17th century. The great Mistress of Ham House, Elizabeth Murray, was accused by her enemies of poisoning her first husband, Lionel, of seducing the wealthy Duke of Lauderdale before her husband’s body was cold, of having an affair with the architect of the English Civil War, Oliver Cromwell, and simultaneously bewitching his foe, King Charles II in exile in France. This is just the kind of vicious rumor-mongering you had to put up with if you were an educated, landed, politically powerful mother of eleven in 1600’s England. Elizabeth’s adversaries make Hillary’s look like rank amateurs. Originally, Elizabeth’s father, William Murray was King Charles I’s (1600-1649) whipping boy. 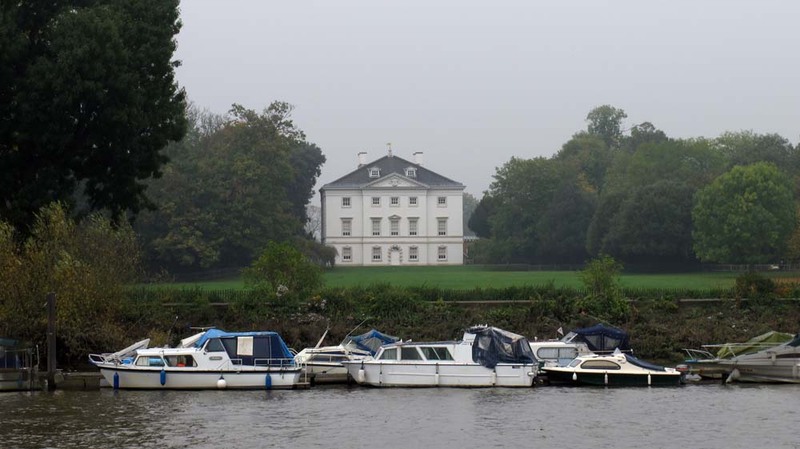 Charles rewarded all that pain with gain by giving his closest friend William, Ham House on the Thames and the title “1st Earl of Dysart”. 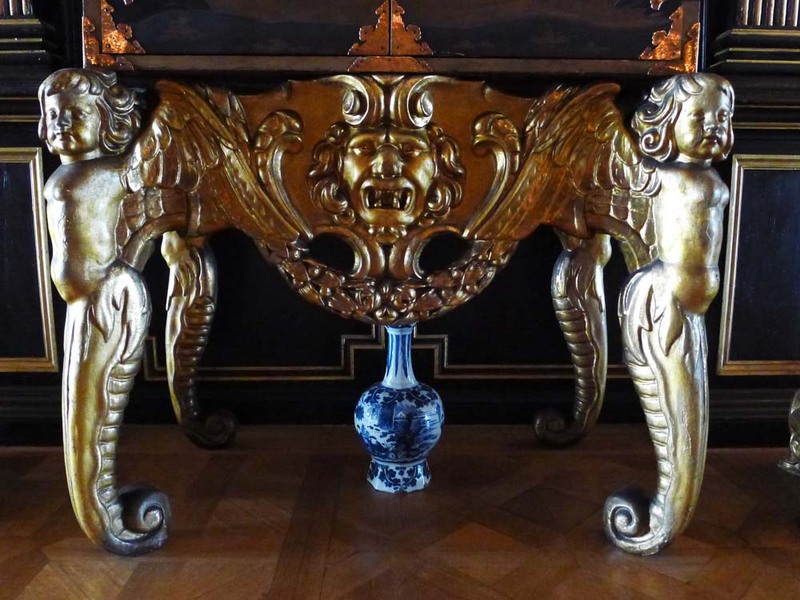 Aside from all those spankings, the thing Charles and William really had in common was their great love of interior decorating. Oh, I know what you’re thinking, but aren’t there plenty of straight English guys who love furniture and knickknacks? 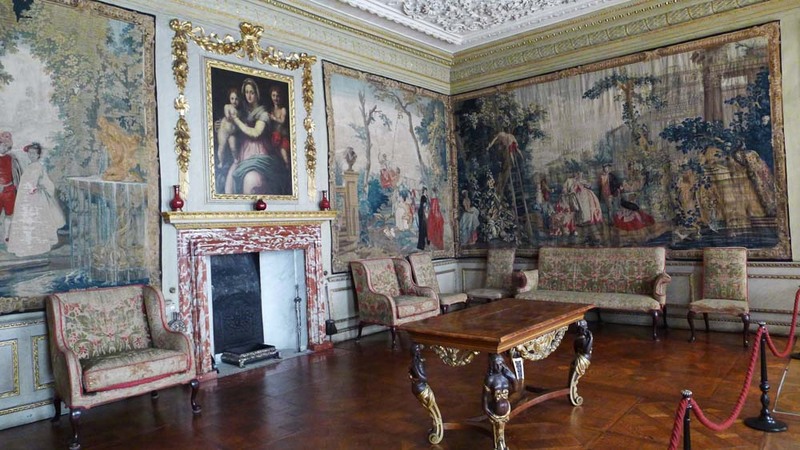 At Ham House William decorated like crazy for about 25 years and then died. Elizabeth, the eldest of his 5 daughters (no sons) was clever enough to petition the king to pass on her father’s title and the house to her – exactly the kind of thing Lady Mary Crawley keeps trying to get her father to do for her at “Downton Abbey”. Before he died, Elizabeth’s father also arranged her marriage to Sir Lionel Tollemache, 3rd Baronet of Helmingham. Some people found it suspicious that Elizabeth endured 11 excruciating child births, but it was always Lionel who complained about feeling ill. It’s probably only a coincidence that poisoning was the fashion just then, and it’s probably a coincidence that Elizabeth was carrying on with the rich, fat Duke of Lauderdale a little too soon after Lionel’s death. She did have the good sense to wait 3 years before she married him and threw lavish parties back at Ham House. Formidable Elizabeth convinced both her wealthy husbands to move into her house instead of her moving into theirs as was the custom. Word is that nobody liked to argue with her. She could be flirtatious and flattering or a hellish shrew. 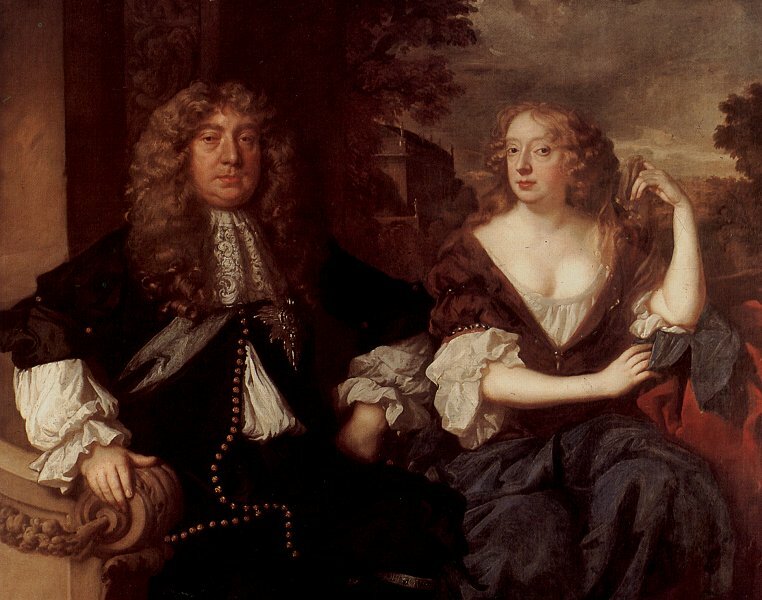 She had the talent to beguile King Charles II into giving her 800 pounds a year for life and at the same time, she fought with her brother-in-law over the high cost of her husband’s burial! By the time she reached 70 she was labeled a “witch” and had relegated a lot of family and friends to her “spam” list! Party animals: Countess Elizabeth Dysart, Duchess of Lauderdale and her well fed Duke of Lauderdale. Besides advertising one’s wealth, the tapestries kept out the damp. 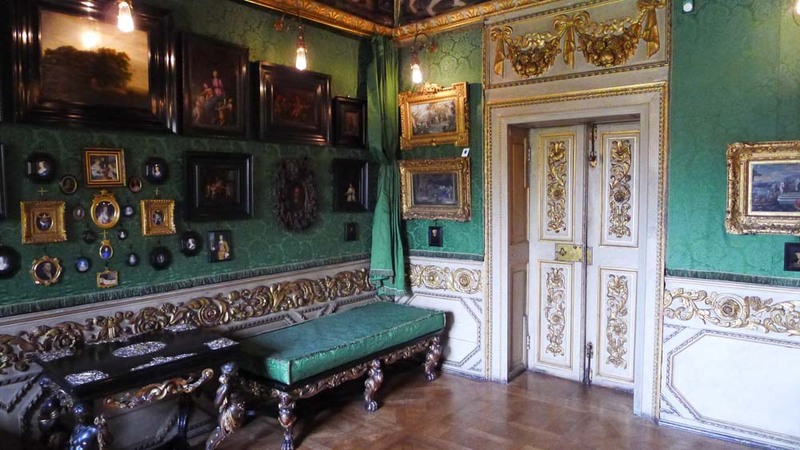 The Green Closet where Elizabeth’s father, William Murray hung all his precious artworks and miniatures. 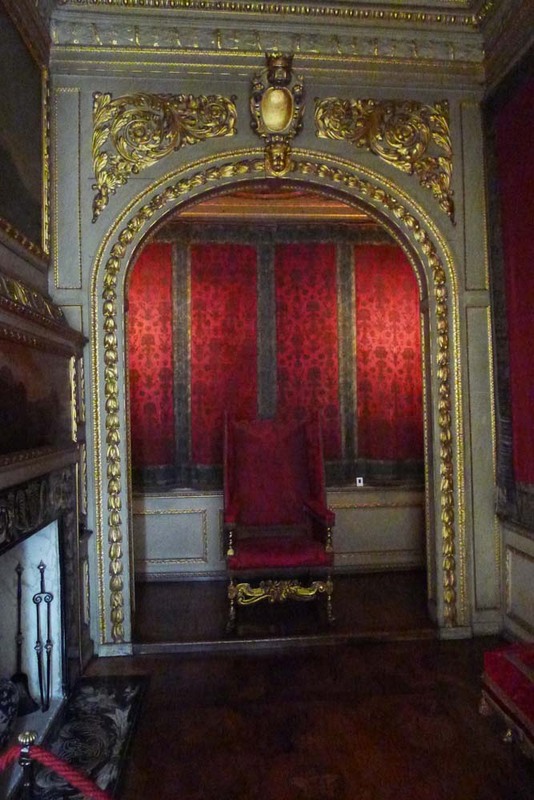 Elizabeth and the Duke added on a suite of rooms for Charles II and his wife, Queen Catherine of Braganza. 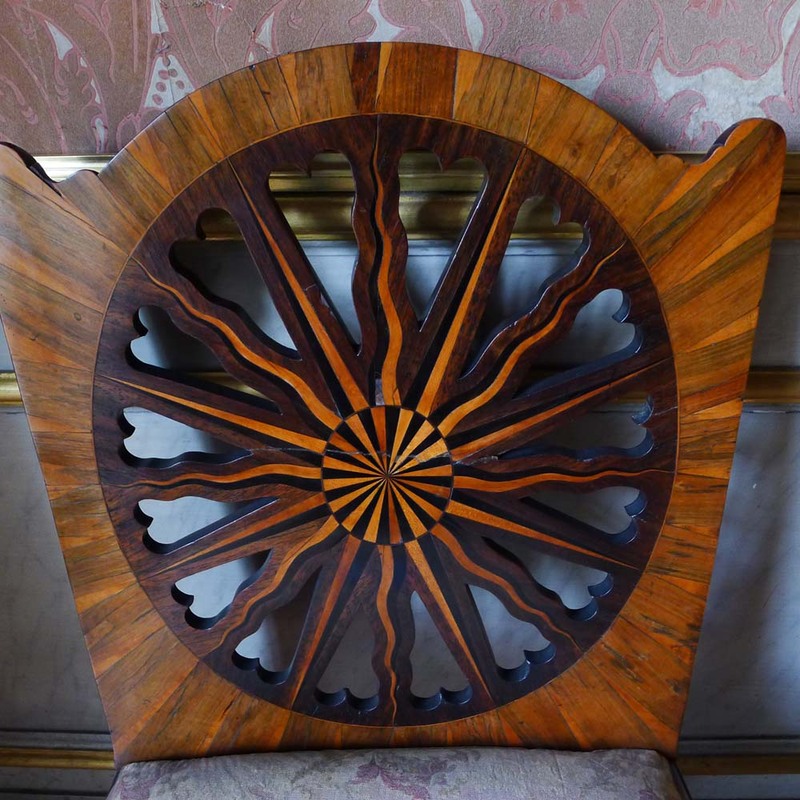 This is one of a pair of “sleeping chairs” – early recliners for the Queen. 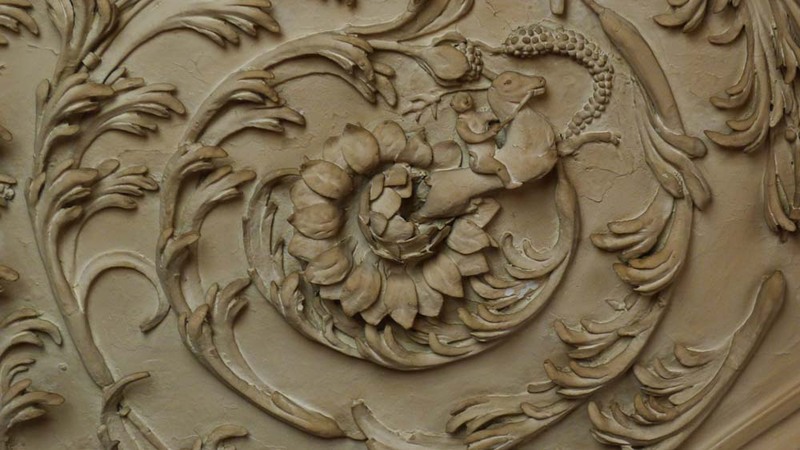 Docents are quick to point out the ceiling carver had a sense of humor – look closely to see a monkey riding a unicorn. 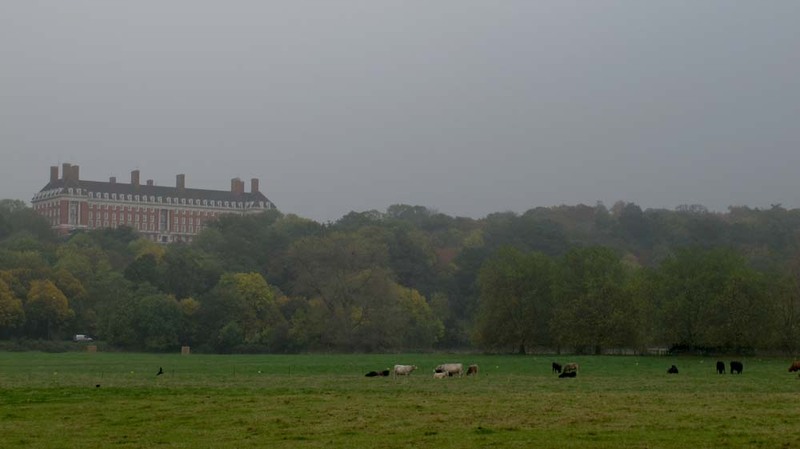 Surrounding Richmond Park is a protected area. 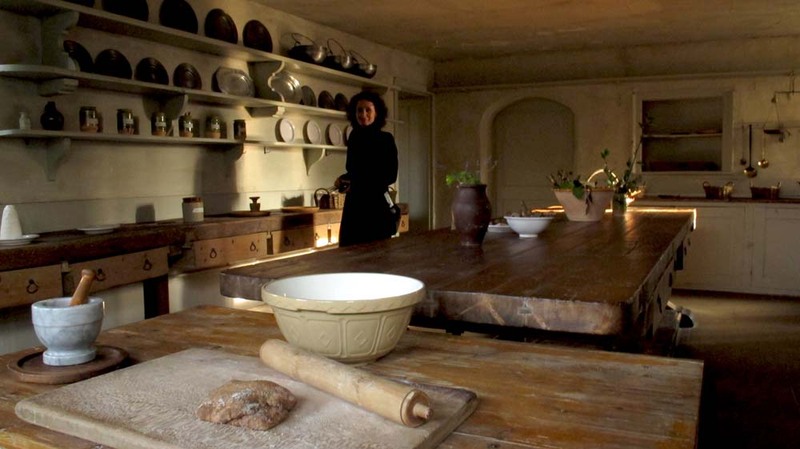 Records show that Elizabeth kept a large kitchen garden to feed her exploding household as well as visiting royalty. 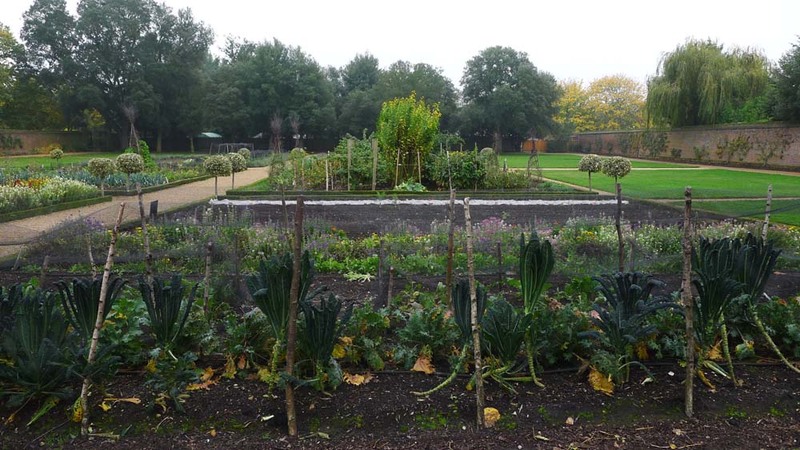 Today the National Trust lovingly tends the fruit and vegetables. You may have light luncheon in the tea room which offers soups and salads sourced from the garden, and sausage rolls which are not. 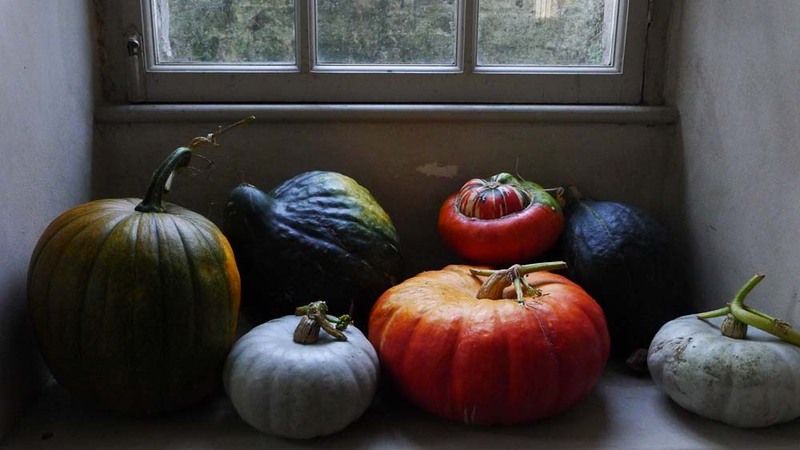 If you visit on a weekday in autumn you’ll find school children baking cookies in the vast downstairs kitchen and you’ll see some of the harvest before winter sets in. 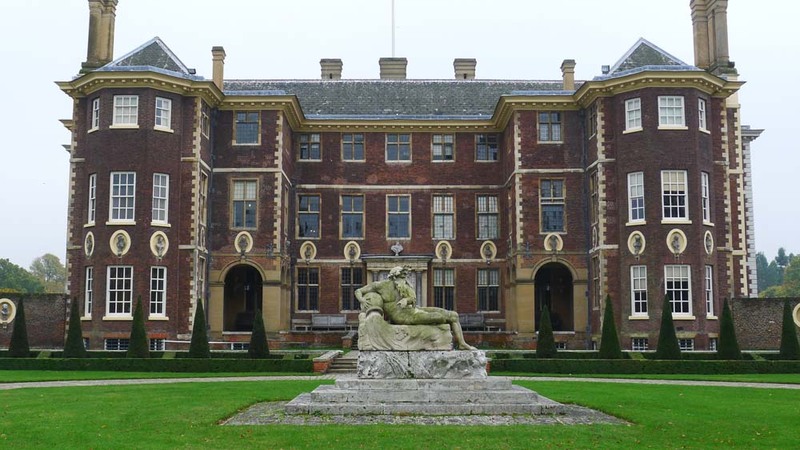 For visiting days and times, go to the Ham House National Trust website: http://www.nationaltrust.org.uk/ham-house/. 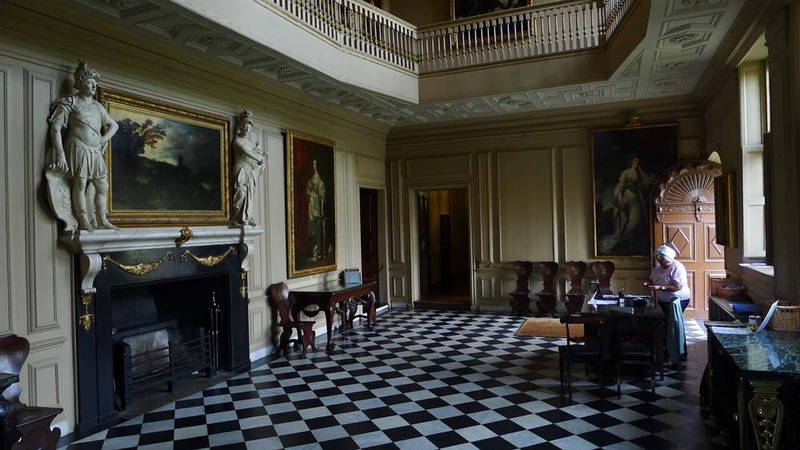 Oh, and keep your eyes open for the ghost of Elizabeth wandering the great rooms!